Scoundrel's Lockbox - Last Chance! Champions of Millennium City, the out-of-this-world Scoundrel's Lockbox is about to rotate out! Make sure to win the awesome costume set, vehicle and more before it's gone! The Scoundrel’s Lockbox makes your wildest space dreams come true! In order to open this box, you require Cosmic Key Power. 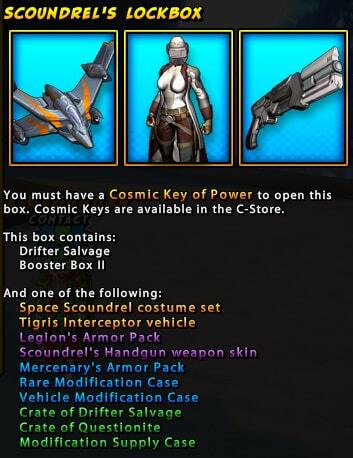 Cosmic Keys are available in the C-Store. Make sure to get yours before this awesome Lockbox disappears in space and time! Millennium City, we do NOT have a problem. 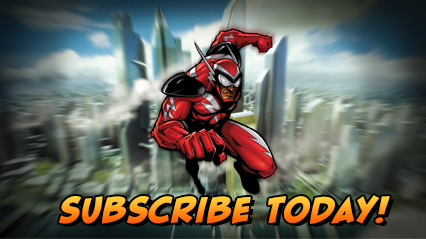 Just an awesome costume set that allows us to fight crime anytime, anywhere! What better ride to fit your brand new awesome look space look, than the Tigris Interceptor. Your enemies won’t even know what hit’em, until it is too late! This lockbox entered rotation on 2/19, and it's about to disappear, so get your prizes today. Happy Lockbox'ing, Champions!